The Infiniti Q Inspiration Concept has no pillar at its rear door, and the back of the vehicle slopes sharply like a fastback, punctuated by a single light strip. DETROIT -- Infiniti's Q Inspiration Concept signals the luxury brand's plan to combine roomier vehicle cabins with more compact powertrains over the next few years. 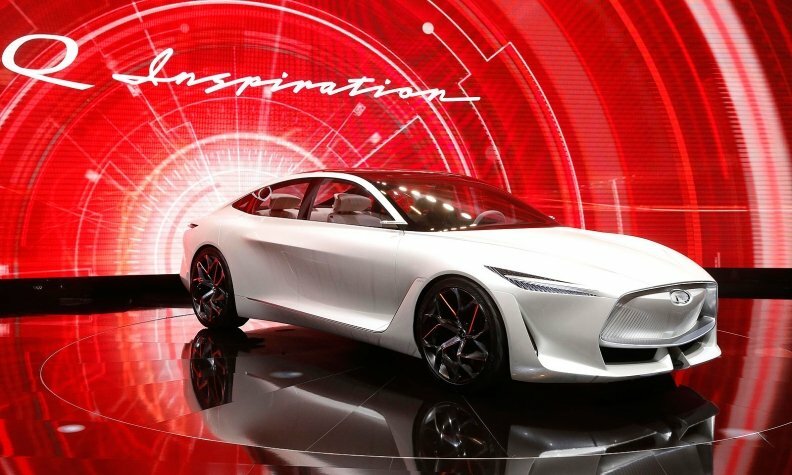 The concept vehicle introduced Monday at the Detroit auto show presages the next Q70 sedan, which is due for a redesign in 2019 or 2020, although Infiniti says only that the Q Inspiration is intended to show its design vision for upcoming sedans. The vehicle features an elongated body with a shorter-than-normal engine compartment. The front end is marked by a double-arch grille and sharp vents at the wheels. The headlamps are strips of LED lights. The car has no pillar at its rear door, and the back of the vehicle slopes sharply like a fastback, punctuated by a single light strip. "The premium sedan segment has become rather conservative," Christian Meunier, Infiniti global vice president, said in a statement. "The Infiniti Q Inspiration previews something that could appeal to a younger audience who seek modern design and new technologies." The Q Inspiration demonstrates how Infiniti plans to power a midsize sedan with its new compact engine -- a four-cylinder VC Turbo -- "combining turbocharged gasoline power with the torque and efficiency of a hybrid or diesel engine," the statement said. The VC Turbo -- a variable compression engine that will first debut this year on the redesigned Infiniti QX50 crossover -- is a physically smaller powerplant that "has liberated Infiniti designers from the constraints of powertrain architecture to realize a spacious interior," the company said. Karim Habib, Infiniti's executive design director, said designers took a minimalist approach to the vehicle's interior to create a clean and calming environment. The results are indicative of Infiniti interiors of the future, the company says. The cabin features dark gray birch wood surfaces and touches of white leather and metallic trim. The cabin floor is flat. The cabin provides four roomy seats with enough legroom to allow passengers to sit with legs crossed on a drive. A touchscreen at each seat features a "meditation-regeneration" mode offering guided meditation and relaxation. The car also monitors a passenger's biometric readings. But Infiniti maintains that what makes the enhanced comfort of the cabin feasible is moving to a more compact engine. 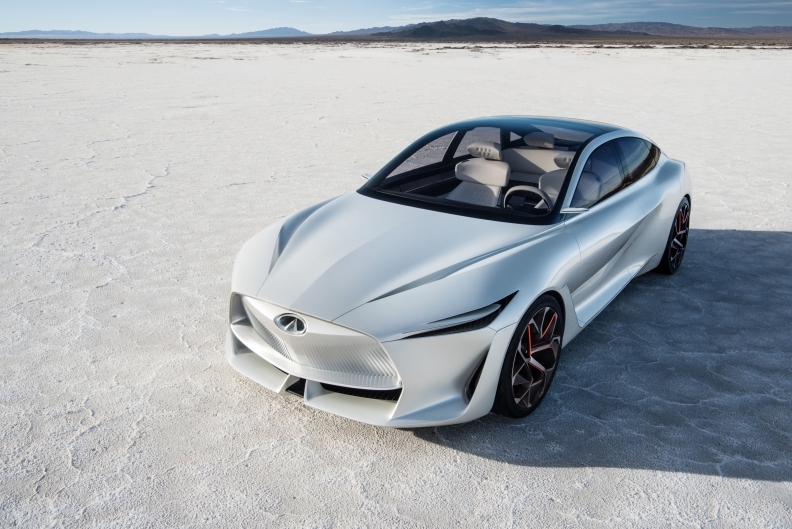 François Bancon, Infiniti's vice president for product and programs, said that while the company has plans "to electrify our product portfolio in the future," the VC Turbo is the logical next step in deploying more efficient engines. "This revolutionary engine offers a compelling blend of turbocharged performance and high efficiency," Bancon said. "These qualities need not be unique to hybrids and diesels."